As the founder of msg systems ag and the chairman of its Board of Directors, Hans Zehetmaier has been managing the company, which forms the core of the group, for more than thirty five years, overseeing its extremely successful development. Prior to founding msg systems ag, Zehetmaier, a graduate in business administration and information systems, worked for IBM. Hans Zehetmaier directs the central Administration & Finances division, Controlling and the Life Science & Healthcare business unit, as well as the insurance industry-specific departments of Solution Consulting South, Business Consulting, Internal Services and Sales Management. He is also responsible for the development of subsidiaries and shareholdings, the group's strategy for the insurance industry, as well as for the SAP partner strategy. He was honored with the renowned "Entrepreneur of the Year -- Finalist 2008" award in October of 2008 for his entrepreneurial excellence. He has been a member of the Senate of Economy, an independent and non-partisan organization committed to eco-human market economy, since 2010. 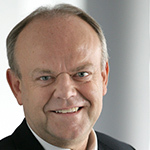 Hans Zehetmaier was inducted into the IT Computerwoche Hall of Fame in 2014 and has been a member of the Academic Board of the Academy of Applied Sciences Landshut since October of 2015.